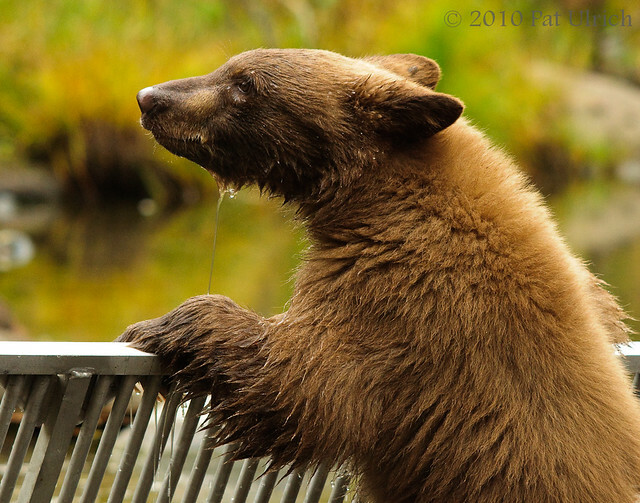 When I was there, the cub would come down to the creek, grab a salmon, then head directly back into the woods. He must have gotten a lot more comfortable hanging out at the creek! The cub seemed pretty confident around the water, he spent some time splashing around upstream of the salmon gate while his mother was on the other side and even once climbed right over the weir. He didn't cosume fish in the river though like the mother did though, he would grab a salmon from the water and then take it to the stream bank or the big log to eat it.